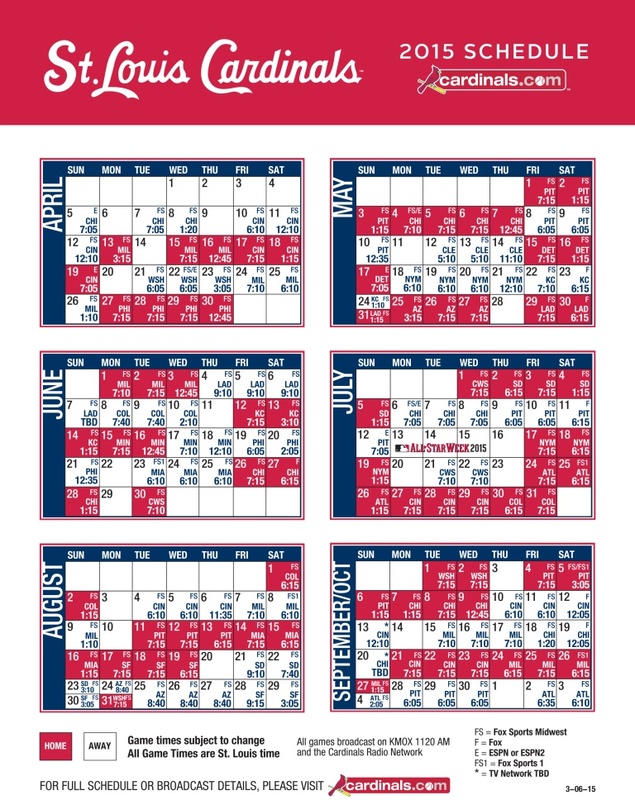 ST. LOUIS, March 11, 2015 – The St. Louis Cardinals today announced that every 2015 regular season game will be televised locally or nationally as well as broadcast on the Cardinals Radio Network. In their 22nd season with the team, FOX Sports Midwest is scheduled to carry 146 games in its fifth season as the exclusive local TV home of the Cardinals. FOX Sports Midwest will also continue to produce the Cardinals Live pre and postgame shows for every regular season telecast on the network. These shows originate from the network’s studio on the second level of Ballpark Village. Dan McLaughlin, Al Hrabosky, Rick Horton and Tim McCarver will call the game action with Jim Hayes and Pat Parris hosting Cardinals Live. In 2014, Cardinals telecasts on FOX Sports Midwest generated the highest local market television ratings in Major League Baseball, the 15th straight year in which the Cardinals ranked among the top three teams. FOX Sports Midwest-produced Cardinals telecasts are shown in ten states and available in approximately four million homes. Fourteen regular season games are currently scheduled to be carried exclusively as part of Major League Baseball’s national television packages with FOX (aired locally on KTVI), FOX Sports 1 and ESPN. The September 13 and 20 games are yet to be scheduled but will be carried by FOX Sports Midwest or be nationally televised. The schedule is subject to change based on future Major League Baseball national television selections. FOX Sports Midwest will televise 15 Spring Training games, the first of which is tomorrow (Thursday, March 12). KMOX (AM 1120) and the Cardinals Radio Network are carrying 18 games. In addition to televised game coverage, KMOX (AM 1120), the team’s flagship radio station and most stations on the Cardinals Radio Network, will carry every regular season game. Once again, most Cardinals pre and postgame shows will be broadcast live from Cardinals Nation Restaurant located in Ballpark Village. This year marks KMOX’s fifth season returning as the flagship station and 55th year overall. Cardinals Hall of Fame broadcaster Mike Shannon and John Rooney are heard on 140 radio stations in nine Midwest states as part of the Cardinals Radio Network. A complete 2015 regular season broadcast schedule follows.